The art of making Tapa was prohibited by the missionaries 75 years ago, until in 2007 the challenge of restoring this long-lost art was re-kindled. Led by Meralda Warren, a 7th Generation descendant, this art is steeped in tradition and Pitcairn culture. 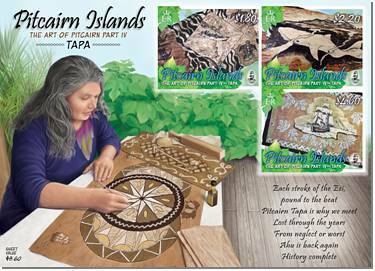 Meralda writes: “The making of Tapa cloth by traditional methods is helping me discover who I am as a Pitcairn artist. Our journey to rediscover Tapa cloth, made by our foremothers who came on the Bounty over 200 years ago, has brought us “Ahu Sista’s” together. Sharing our thoughts of our work, our history, have bonded us more though we are at times many miles apart”. The process of Tapa making is complex and involves harvesting the Aute plant, stripping the bark, beating, sealing and design. The results, as shown in the stamp issue, are stunning examples of South Pacific art. 1. Knowing when and how to harvest the Aute plant. 2. The outer bark is stripped from the inner fibrous paper mulberry bark using a sea-shell. 3. The bark is then soaked in citrus juice instead of water before finally beating the bark out into a piece of beautiful, workable cloth over a wooden log using a carved wooden beater. 4. Once dried and the texture is satisfactory, the piece is sealed using Arrowroot cooked to the right consistency. For a large tapa the pieces are joined together on both sides and sealed using the thickened Arrowroot glue and the fibres are pounded together. 5. The design process then begins by gathering the bark from the Doodwi tree. The bark is boiled in water for several hours to extract the rich brown colour-fast dye. The bark of the Nano tree, Pulau flowers, the juice of the mulberry and the Uru breadfruit bark also offer other dye colours. 6. Doodwi nuts are burnt and the soot is then mixed with a little doodwi bark dye. 7. Leaving the natural contours of the bark, the designs are then created. The Polynesian petroglyphs are used as inspiration for designs, as well as Pitcairn’s natural flora and fauna. 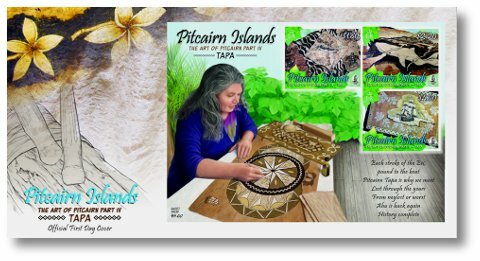 Tapa is a worthy inclusion in the Art of Pitcairn stamp series. The processes are being documented and the skills are being passed onto future generations. 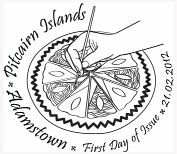 This will ensure the art will survive, giving Pitcairn a shared yet unique place in South Pacific tapa making. Acknowledgement: The Pitcairn Islands Philatelic Bureau wishes to recognize the support given by Meralda Warren in making this stamp issue possible.